At Loukonen Bros., we can do just about anything with natural stone, from patio pavers to custom stone furniture. We enjoy delivering one of a kind creations to our customers in Longmont, Boulder, Denver, Fort Collins, and the rest of the Front Range in Colorado. Natural stone makes a great building material because in addition to being extremely durable and functional, its natural beauty really makes an impression. 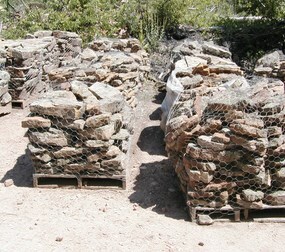 This is especially the case with our mossrock boulders and moss veneer landscaping rocks. Now you can add a bit of natural beauty to your yard, patio, driveway, or garden with decorative stones that have living moss or lichens growing on them. 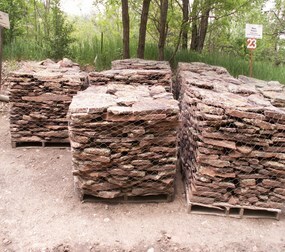 Perfect for edging, landscaping cover, creating rustic paths, retaining walls, or just adding some beauty to an empty spot in your yard, our moss veneer landscaping rocks are available in sizes anywhere from 50 to 5,000 pounds. If you’re thinking about adding some mossrock to your home, contact us today! Size: Random sizes that range from 50 lbs to 5000 lbs. Dimensions: 12″x 12″x 12″ (Breadbox) to 36″x 48″x 24″ (Small Car). Coverage: General Landscaping cover, Give blank areas distinction. Uses: Edging for Walkways/paths, Decorative Barriers, Retaining Walls. Base Stone-Most mossrock base stone is a Red, Gray or Brown color. 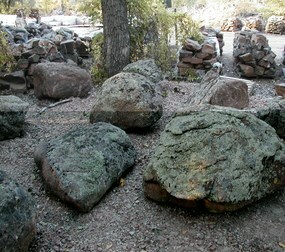 Lichens-Most lichens are a Greens, Grays, Tans, some Orange and Blacks. Size: Random sizes that range from 1 to 3 sq ft.
Thickness: Ranges from 2″ to 4″ thick. Coverage: Mossrock veneer covers 45 to 60 sq ft per ton. Uses: Veneer, Walkway edging, rustic paths, Retaining Walls.